Abstract: Photonic crystal nanostructures open unprecedented opportunities for construction of novel photonic devices and integrated nanophotonic systems, due to their unique capability to manipulate light at sub-wavelength scales. In this talk, I will present our recent work on photonic crystals and their applications. I will show ultra-fast photonic crystal nanocavity lasers that can be modulated at speeds far exceeding today's state of the art semiconductor lasers. The ultra-fast speeds are due to the use of cavity quantum electrodynamics effects such as spontaneous emission rate enhancement. I will then introduce two dimensional coupled photonic crystal nanocavity arrays and show that they can reduce the group velocity of light by many orders of magnitude. In addition, I will show the implementation of these structures in active media com! posed of multiple quantum wells for low threshold and high power nano-lasers. These coherently coupled nanocavity lasers achieve dramatically higher power conversion efficiency with respect to other nanocavity lasers. Finally, I will present photonic crystal nanocavity sensors and discuss their integration with microfluidic systems for sensitive detection. 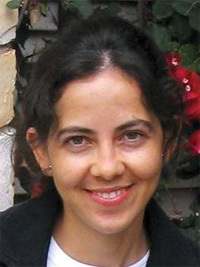 Biography: Hatice Altug is an Assistant Professor in Electrical and Computer Engineering Department at Boston University. She received her Ph.D. degree in Applied Physics from Stanford University in 2006, and her B.S. degree in Physics from Bilkent University (Turkey) in 2000. During her PhD, she is awarded Intel and IEEE LEOS Fellowships. Her research involves design and implementation of high performance and ultra-compact nano-photonic devices and sensors i! ncluding lasers and all-photonic switches and their large-scale on-chip integration for communication and bio-sensing applications. Previously, Altug worked on multiple quantum well electro-absorption modulators for optical interconnects, three dimensional metallic photonic crystals, microscopic theory of vortex states in superconductivity, phase transition in superconducting NbTi wires, and electron conductance quantization in metal nano-contacts. Her work on ultrafast photonic crystal nanocavity work has been featured on the cover of Nature Physics, and highlighted in Nature Photonics and Laser Focus World magazines. Her work on nanocavity lasers received Best Paper and Research Excellence award in IEEE LEOS Conference in 2005. She received the first place award in the Inventors' Challenge competition of Silicon Valley with her work on micron scale all-optical switches. Her work on slow light and nano-cavity lasers has been featured on the cover of Applied Physics Letters and highlighted in several magazines.